Sewing with faux leather has several advantages over real leather, besides it being the obvious choice for vegans and those making a humane statement. While not all leather is inhumane, many people choose vegan or faux leather on occasion if it suits their taste when animal welfare is a topic. Faux leather is much easier to sew than real leather, and it doesn’t need to be punched through first in order to sew it, like thicker real leather. Faux leather is also much cheaper than real leather. It now comes in an array of styles and finishes. Even rarer types of faux leather like alligator and ostrich now look more and more like the real thing. In addition to becoming more realistic-looking in recent years, faux leather is much easier to clean than real leather. This is a big deal for people who wish to avoid the high-maintenance conditioning routine for real leather as well as the dry cleaning bill that goes with it. Much like when sewing with genuine leather, faux leather shows any hole punched into it, and so it doesn’t forgive sewing mistakes very easily. You will want to carefully measure twice and cut once with this fabric. You will also sew very slowly at first to avoid wiggly stitches, because you can’t really seam rip and sew again with this material. 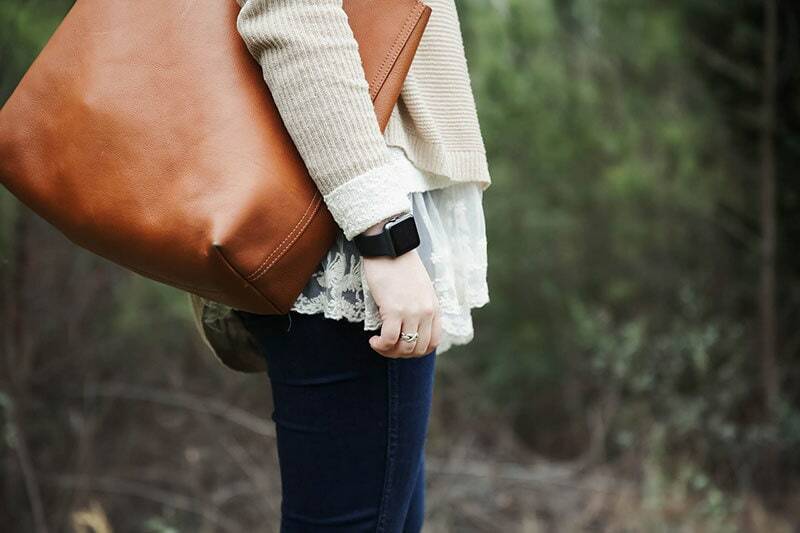 Faux leather can be sticky to sew with while you are getting used to it. There are a couple of things you can do to work with the stickiness, as you will see further on. But suffice it to say that it can be an unusual material for the first-timer, and you will want to give yourself a bit of extra time to carefully hold the fabric as it moves through the machine. Faux leather wears needles down faster than regular fabric. Plan on buying a pack or two extra if you sew with this material a lot. A dull needle is pretty hard to sew with, so if you notice snagging or slower machine work, you will want to be prepared with a new needle. With a bit of practice and preparation, you can sew for hours if you wish with this material despite its challenges. Let’s look at some tips on how to successfully sew with faux leather on a home machine. Faux leather is not a material you can use pins with. If you use them, they would only be on areas that the finished product isn’t cut from, and that really doesn’t help much. So, choose a set of pattern weights that you are comfortable with that don’t slide too much instead of pins. You will also want a cutting mat, a sharp utensil for cutting with of your choice, and a ruler. You will have to cut the faux leather right side up on the cutting mat, using the pattern weights to hold it in place. Use your cutting utensil of choice to cut the leather and your ruler to measure straight edges. The pattern will obviously sit on top of the leather while the pattern weights hold it in place. Generally speaking, you should not fold the fabric for cutting or try to cut through more than one piece of faux leather at once, so preserve your pattern pieces carefully. You will have to cut double pieces individually. You can work around the stickiness of the faux leather by changing the pressure foot out. Usually, the leather will stick too much to a metal foot. You could try a roller foot or telfon one instead, or use a even feed walking foot. This is most important when sewing on the topside of the fabric, such as with topstitching or hems. Accuracy can be an issue when the fabric is sticking to the foot, affecting the overall look of the finished sewn piece. So you will want to make sure that you investigate several options for a non-sticky foot and choose one that works specifically with the type of faux leather you are using. In some cases, your home leather sewing machine will have a special pressure feed system to help alleviate the stickiness. An example is Janome’s AccuFeed Flex system. These types of feeders are a great option if you plan on sewing with either faux leather or other unique fabrics like chiffon or organza often. Alternatively, you can place a strap of wax under your machine foot. This is a way to offset the stickiness of the faux leather and will help you utilise the pressure foot that you already have. You can remove the strap easily without damaging the foot. It will keep the faux leather from sticking to the pressure foot and reduce friction a little bit while sewing. Simply set the strap in while sewing and remove when you’re finished. Be sure to change your needle often to keep it sharp. In addition, consider keeping one machine set and tensioned for zig zag or other decorative stitches if you use those often. Use stitches a little larger than you normally would to keep the fabric strong, and consider getting an extra-sharp needle with a smaller hole than normal. If you keep these things in mind as you are sewing and optimise your machine to suit the fabric, you should have good success sewing with faux leather. It brings a whole new range of possibilities into the realm of sewing and the chance to work with an ultra-modern look. You can try your hand at bags, gloves, and accessories like wallets made of faux leather once you get your machine set up and a few practice rows down straight. Remember to try different things to reduce the stickiness; for example, if the first wax strip doesn’t work, try another type of wax until you find the right one for the type of leather you are working with. Remember to optimise your thread as well, and enjoy your finished product as much as you enjoyed sewing it!